On Friday evening 30th November, 10 Brethren from the East Ribble District, accompanied by a regular visitor from France, took a trip to the seaside to visit the third ever meeting Pro Patria Lodge No. 9952 in the wonderful surroundings of St Annes Palace, a converted picture house in the centre of St Annes. 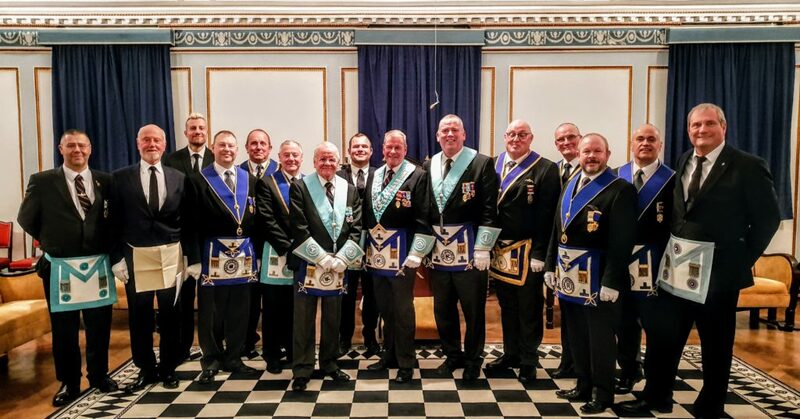 The Military Lodge, whose members have all served in Her Majesty’s Armed Forces was consecrated in February 2018 and meets in different Halls across the West Lancashire Province. The business of the evening was an Initiation Ceremony and on entering the Lodge Room the Brethren were excited to find a number of large couches around the edge of the carpet, which as well as being extremely comfortable, made for a more relaxed feel to the meeting, the Brethren did all agree to wake each other up if anyone started to nod off! When the Lodge was established it wanted to do things slightly different, and this could be seen in the way the lodge conduct their business. For example, the Director of Ceremonies carries a pace stick instead of a wand, and the charity collection is given in a military cap that is passed around the Brethren. The festive board had its own nuances that pointed to a military mess dinner, something that retired Armed Forces Brethren wholly identify with. It was also very amusing to hear the cross services banter that ran across the members both inside the Lodge and at the festive board. The business of the evening was conducted with Military precision and the candidate was very well looked after. His responses were given in a most confident and audible manner and his pride at becoming a Freemason was obvious. This was a wonderful visit and a different kind of experience, all agreed that their Masonic Knowledge and Masonic experiences had been enhanced by the very welcoming Brethren of this new and developing Lodge. Main Image: Pro Patria Lodge Master and Wardens with the newly Initiated Brother along with the East Ribble Brethren.